Newest Program: Get up close and personal with an African Black-Footed Penguin in Gulf World's new interactive habitat. 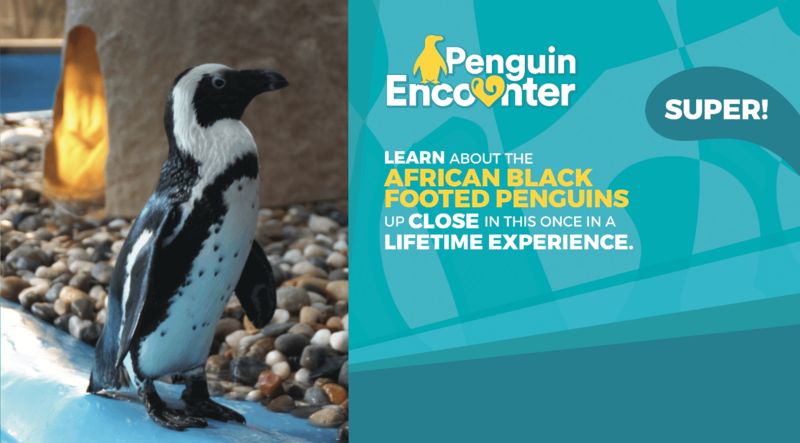 Guests will be immersed into the African penguin salt water habitat where they will get to interact and learn about the Endangered African penguin from animal care specialists. Behaviors: Touch penguin, cradle, swim by with touch, free time in water with penguins learning about the animals and enrichment. An all-day admission to Gulf World is included with your interactive program. Please set aside extra time to explore the park. Photos of your experience with the penguins. Participants must be at least 8 years old to participate. Participants must be physically fit and agile to access the animal habitat. This program can have groups of up to 4 people. Guests will be immersed into the African penguin salt water habitat waist deep and may be exposed to fish that is fed to penguins. Get up close and personal with an African Black-Footed Penguin in Gulf World's new interactive habitat. Guests will be immersed into the African penguin salt water habitat where they will get to interact and learn about the Endangered African penguin from animal care specialists. Touch penguin, cradle, swim by with touch, free time in water with penguins learning about the animals and enrichment.